My introduction to Cougar Crest was actually from their Viognier even though they specialize in fantastic Walla Walla reds. I could write poetry about the glossy mouth feel and flavor array of their regular Viognier but I'm writing today about the treat of their Late Harvest. After a great meal, the dessert menu invariably comes around and folks waffle about whether they should or not. A recent trip with family poised me for many meals out and sweets menu options. My brother's girlfriend and I leaned towards port and late harvest tastings which ended up to be much more fun than the cake everyone else was ordering. Back home, at the gallery, I am asked for sweet wine options often. Being as that the Viognier from Cougar has made me weak in the knees, I thought the Late Harvest 2013 would be the perfect fit and I wasn't wrong. With a nose of brandy and orange blossom, the Late Harvest warms with mouth with the sweetness of ripe tropical fruits with a honeysuckle and spice finish. Lighter and livelier than a typical desert wine, this Viognier is dangerously drinkable. They say to pair it with Creme Brulee which just so happens to be my favorite dessert if I dare to do some. Both might be some kind of nirvana that I haven't deserved to reach yet. Cougar Crest is in Walla Walla Washington where the Hansens create award winning Estate Wines. Come try the Late Harvest at the gallery for a chilled summer treat or keep your eyes open for their other offerings. The Brandborgs say it’s a ‘vacation in a glass’. I have to agree. The wind is blowing 24mph from the South with rainy gusts to 40. It's autumn on the beach but it's doing a good job of being wintery. While the atmosphere plays percussion on my windows, I desire to feel cozy and warm with a glass of something yummy. Better than a blanket, bring the Volcano! Lava Red 4 is a red blend from Volcano Vineyards in Bend, Oregon. It contains Cabernet Sauvignon, Syrah, and Mourvedre for a captivating taste bud romp. The nose is sweet spice and woodsy, kinda sassy. It holds true on the tongue with that kitchen spice leading into perky pomegranate notes and dark berries. There's definitely something warm and fuzzy on the finish that doesn't last long enough to keep me from taking the next sip or the next glass. I was stymied on my first samples of the wine by a flavor I couldn't put my finger on. I really liked it, and it was familiar, but it wouldn't register as a taste. It had something to do with the sweet almost vanilla like tones blending with the wood. It finally hit me; Amber. If you have ever smelled the essential oil from amber resin, it has a lovely, sweet wood smell different from cedar or sandalwood. It's one of my favorite smells and this tastes like that smells, an unusual treat. This lively red blend is beguiling enough to sip alone but is really nice with red meat, pizza, and even the bison stroganoff with chanterells we love to make this time of year. Liz and Scott have a tasting room in Bend, where they make their wines. You might notice that there aren't any big vineyards in Bend (yet) so they get their grapes from the Rogue region and the Columbia regions as well. I look forward to the Lava Flow on the Ozone tasting list this winter and indulging on their Sangrias in their tasting room next summer. Cheers. Welcome to the first post of 'Botrus Banter'. At the Ozone; we do wine tasting, wine is art, art happens well with wine, we are making wine, and chatting about wine is fun. I hear so many of your great and quotable comments about the wines circulate through our flights that it seems just wrong not to share some of this content with our readers. I mostly like to do local to Oregon or local to Willamette Valley wines on the tastings. I do carry imports just in case I have someone tasting that has tried *everything* in the Pacific Northwest. Some folks do try. We live in hog heaven for great grapes, but alas, my first post will be an import with a barrage of wonderful vintages from Oregon to follow, I promise. The forecast calls for 70-75 degrees on the coast in Newport, OR. for the Labor Day Weekend. What do you do? Reach for something chilled. Something not too sweet, not too dry. Something to go with fresh tuna off the boat, Dungeness crab or other delicious offerings from the fish counters. This warm bouquet, sweet nosed 100% Grenache is aimed directly at pleasing this palette. Noticeably bright in the glass, this Grenache presents an off pink, blush color that is the same hue of satin pointe shoes. Like the ballerina that wears them, the wine is graceful, crisp, and strong. Salt and citrus command the first taste as strawberry and nectarine bring up the following palette. Very clean on the exit, it's just like the prima ballerina escaping the petite allegro via a 'jeter' off stage. 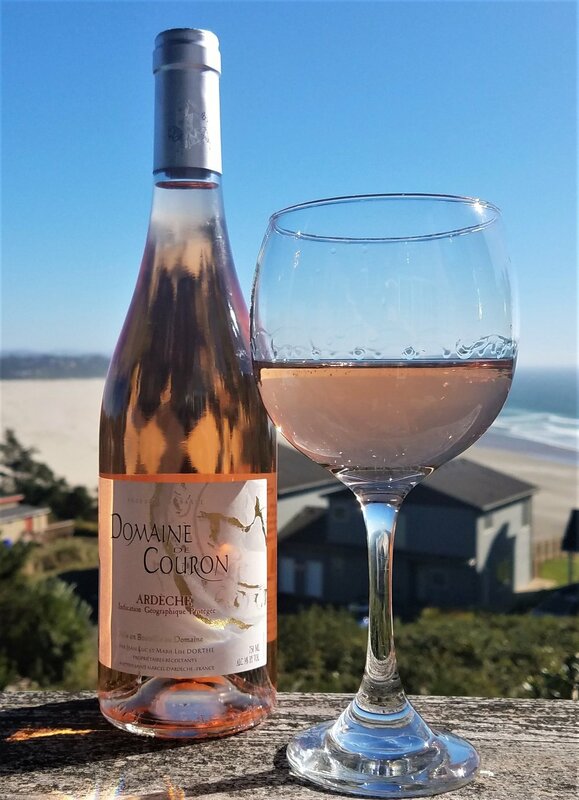 Leggy enough to last but light enough to want the next glass, this dry Rose' is a pleaser to anyone looking for a white wine crossover, with a little more zest, to pair with most seafood or to recline as a stand alone sipper on the deck after a beautiful day at the beach.